Thank you to our parents for coming to Student Led Conferences today. We were very proud to share our learning with you! We enjoyed sharing writing samples, videos, assessments and reflections. Thank you for listening, making positive comments and asking questions about our work. We’ve grown so much in Grade 4 and we are having a wonderful year! What were you most proud to show your parents? What advice or feedback did your parents give you? I was nervous when I did the S.L.C because I couldn’t think of what I wanted to say to my parents but after awhile, I could think of words to say and I explained all my tasks. My parents seemed very interested in my work. The work I was most proud to show my parents was my research (finding the information about ancient China) and also my art work. In this portfolio there was so many works that were fun and some work was the best I have ever done. I also liked to show my parents that I type by myself on the computer. I made my parents proud of me and I learned to use strategies to make my work better. You know I like to doing all work but some of the work was hard for me. I was also proud of myself because my work was better than when I was in the grade 3. I wish to be better and I will keep trying. I was very proud to show my work to my parent. I think she was very proud of me and thank you for teaching me to make me work better. It was an awesome student led conference. The work I was most proud of was the multiplication test because first it took 5mins to get 25/30 correct but on the second test, 30/30 correct in 56 seconds. I have improved a lot. 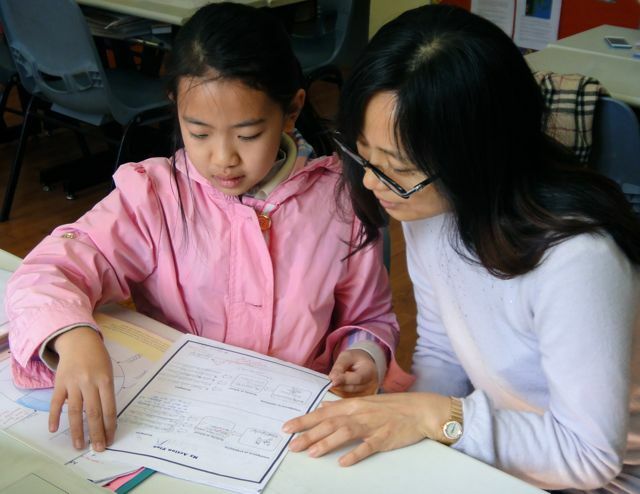 It was very fun to do Student Led Conferences because my mother was very proud me and she was amazed by my work. I also told her many things that she don’t know. I loved my Student Led Conference. I enjoyed doing the student led conference. It was fun to do the experiment with the balloon and the lightbulb + tornado experiment that we made. Also, it was the first time I showed my things and explained them. I enjoyed the art exhibition by Gr.1,2,3,4 and 5. I am looking foward for the next student Led Conference! My mom was proud of my work because when she looked at it she said, “You did a great job of your class work.” She also said that some of the work I did needed more ideas. I will try to improve. This was my first time to show my work to my parents and explain it to them, too. I’m looking forward for the next Student Led Conference. Thank for giving us time to show our works to our parents! My Mum also said to me that I should thank the teacher for teaching us well and being kind to us! She said you are the best teacher that she ever saw! I also agree. My S.L.C. was little bit quick, but it was also fun! My mom just said, “I am really proud of you, Na Youn!” She liked most of the work I showed her and she also gave me some ideas to improve. I think if I use the advice well, my improvements will be great! My Mum’s favorite work was the “Pandora” video. She said she can see the narrateos’ enthusiasm and drama. She also loved all the actors in “Pandora”. She wanted to be see the whole video, but we didn’t have much time, so we couldn’t see it all. But when my mother went to our house,she wathched the video 3 or 4 times! She also loved the art exhibition! Her favorite part was the art that we made from books. She thanks everybody for the art exhibition and S.L.C.. Escpecially thank for Ms. O’Dwyer, Ms.Davies, Mr Papaseit and Ms. Qiong! It was a great idea to have an S.L.C with our parents.It was my first time to do an S.L.C. So I was very worried but I thought I did it well. My mom was proud of me for my Ancient Rome research because she were suprised that I did the research by my self.I thought my parents enjoyed our S.L.C. Now I am thinking of my next Student Led Conference!!! When I was about to start the S.L.C I was very nervous but when I got to the middle of the conference, I got used to it and I was not to nervous.This S.L.C made my stage skill ( talking to people on stage skill ) got better. This is not my first S.L.C but I enjoyed it a lot. My mom was proud of my ancient civilizations reflection. I was pretty proud of it too. What work sheet were you proud of?